Tropical Storm Fay has moved back over water between Haiti and Cuba this morning. The circulation is somewhat disorganized from its encounter with land, but estimated maximum winds have increased slightly overnight to 45 mph. Various watches and warnings are in effect for Haiti, eastern Cuba, Turks and Caicos, southeastern Bahamas, Jamaica, and Cayman Islands. Interests in western Cuba and Florida, including the Keys, are advised to also monitor the storm's progress. Fay is expected to intensify, probably reaching hurricane strength in the next couple of days, but the amount of intensification depends on the amount of time the storm spends over water. There is also a large amount of uncertainty in the forecast path, but the current prediction brings the storm northward across Cuba and the Florida Keys to a landfall on the Florida peninsula. A reconnaissance flight is scheduled for this afternoon to investigate the storm's strength and organization. Tropical Storm Fay developed late this afternoon near the eastern Dominican Republic. Tropical Storm Warnings have been issued for the north coasts of both Haiti and the Dominican Republic. Warnings are also in effect for portions of eastern Cuba and the southeastern Bahamas. At 5 pm, Fay was located about 35 miles east of Santo Domingo, Dominican Republic and about 400 miles east southeast of Guantanamo, Cuba. Movement was westward around 14 mph. Maximum sustained winds were just over minimum tropical storm strength at 40 mph. The main immediate threat from the storm is for torrential rains, which can produce flash flooding and mudslides in Hispaniola and eastern Cuba. Tropic Thunder: Fay Finally Forming? Update:The National Hurricane Center has issued a Special Tropical Disturbance Statement indicating that the low pressure area has not yet developed into a tropical depression, but that cyclone formation could occur at any time in the next couple of days. After a lull through most of the first half of August, the tropical Atlantic is heating up again. A stormy area which has tracked westward to near the Virgin Islands is looking more organized today. The National Hurricane Center is now giving this a high probability of development into a tropical cyclone in the next couple of days as it moves towards the Bahamas and Florida. If a storm does develop, it will be called Tropical Storm Fay. A reconnaissance flight now investigating the area has already reported surface winds as high as 34 knots (39 mph). Jeff Masters notes in his blog on Weather Underground that conditions appear favorable for further development. Radar images from the area are showing signs of rotation. The latest Arctic sea ice update from the National Snow and Ice Data Center (NSIDC) reports that the rate of melting has accelerated in the first 10 days of August. As a result, "Amundsen's historic Northwest Passage is opening up." Although the extent of melting so far is less than last year's record, it is still way ahead of the long term average. See DeSmog Blog and Climate Progress for further comments. 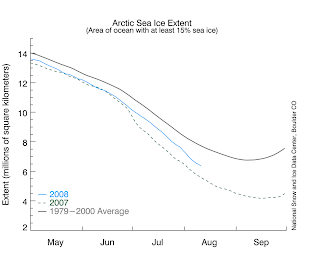 Image from NSIDC shows 2008 Arctic sea ice extent vs. 2007 and long term average.